Kalakshetra is a cultural academy dedicated to the preservation of traditional values in Indian art, especially in the field of Bharatanatyam dance and Gandharvaveda music. The academy was founded in January 1936 by Rukmini Devi Arundale. Under Arundale's guidance the institution achieved national and international recognition for its unique style and perfection. 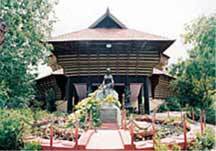 In 1962, Kalakshetra moved to a new campus in Besant Nagar, Chennai, India. In 1993, an Act of the Indian Parliament recognised the Kalakshetra Foundation as an Institution of National Importance. or Holy place). The name Kalakshetra was suggested by Pandit S. Subramania Sastri, a Sanskrit scholar and member of the academy. Deriving inspiration from this noble ideal, Kalakshetra was established, in the words of Rukmini Devi, "with the sole purpose of resuscitating in modern India recognition of the priceless artistic traditions of our country and of imparting to the young the true spirit of Art, devoid of vulgarity and commercialism." The training of young and talented people by masters of art, with the background of a religious spirit, has been its main aim.